By Vicki Rae Thorne, certified aromatherapist, herbalist, founder & owner of Earth Heart Inc. Many dog lovers have concerns about the increasing use of prescription medications for their pets. While both effective and necessary in certain situations, these medications carry the same potential problems and contraindications as medications for humans. Many canine professionals and owners have discovered alternatives to using some medications. These include a change in diet, proper canine communication, and natural remedies such as herbs and aromatherapy. 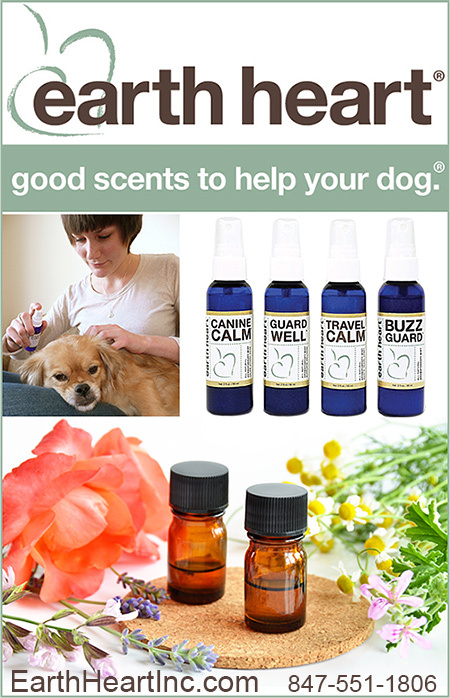 Aromatherapy can be a safe and effective natural healing tool for your dog. It can be used alone or in combination with other therapies. Essential oils can be used singly or in formulations for specific purposes such as restlessness, upset tummies, skin irritation or respiratory support. As with any home remedy, it is important to know the use and safety guidelines, and to recognize when it is time for professional help from your veterinarian. Scientific studies in Germany and France regarding the medical effects of essential oils on animals and humans were quite advanced by the mid-1800s. Because of positive clinical results, the practice of veterinary aromatherapy was not uncommon in these countries by the mid-1900s, and the practice of both human and veterinary aromatherapy has continued to gain in popularity and credibility. The word “aromatherapy” was coined by a French chemist named Rene-Maurice Gattefosse. In July 1910, Gattefosse was involved in a laboratory explosion. Both hands were covered with gaseous gangrenous sores. He plunged his hand into a nearby container of clear liquid, which immediately stopped the gasification of tissue. The very next day, Gattefosse saw that the damaged tissue was already beginning to heal. The mystery liquid was lavender essential oil. This profound experience led Gattefosse to document remarkable results in healing all kinds of wounds and sores with lavender essential oil. The simplest definition of aromatherapy is “healing with scent.” Specifically, aromatherapy is the therapeutic inhalation and topical application of pure essential oils to restore or enhance health, beauty and well-being. When inhaled, scent molecules trigger an emotional or behavioral response in the limbic brain. When inhaled or topically applied, they are absorbed into the bloodstream, promoting a physiological response. Therapeutic use in aromatherapy indicates the use of a substance for a specific healing purpose. Clinical studies over many decades have shown essential oils to have a variety of medicinal properties. These include analgesic, antibacterial, antiviral, antifungal, antispasmodic, antiinflammatory, antiseptic, detoxifying, expectorant, regenerative, sedative and immuno-stimulant actions. Essential oils are the volatile oils produced within the seed, flower, leaf, bark, root or resin of aromatic plants. Plants produce essential oils for purposes of self-preservation. This includes attracting insects for pollination, repelling pests and resisting microorganisms that can destroy the plant. Essential oils are complex chemical components within the plant that can be extracted by steam distillation, cold-pressing, and carbon dioxide or solvent extraction. Not all plants produce essential oils, and so not all aromas are included in the practice of aromatherapy. Many products on the market use synthetic fragrances such as peach, apple or strawberry. Synthetic fragrances are not therapeutic, and in fact can cause problems, including headaches, agitation or allergic reactions. It is therefore important to use high quality pure essential oils from reputable companies. Essential oils are highly concentrated. For example, 200 pounds of lavender tops are distilled to make one pound of lavender essential oil. Because of this concentration, it is accepted practice to dilute essential oils before use to avoid problems such as skin irritation or overwhelming the sense of smell. This is especially important with remedies for dogs, because they have a much stronger sense of smell than humans. Scent is powerful. It has the ability to conjure detailed images, to transport us to a different time and place, to lift our spirits and calm our minds. Scent can attract or repel. It helps us taste our food and keeps us from danger. It reinforces pleasure and influences our ability to produce hormones. Consider the emotional effect of smelling a roasting turkey or fresh-baked cinnamon rolls, the ocean air or a pasture filled with sweet clover. Nature put the nose in the middle of the face, and the olfactory bulb is the first receptor in the brain. This gives scent a significant role in the limbic system, which is the seat of emotion, memory and learning. The sense of smell has been called “memoristic,” triggering an emotional response before a cognitive one. This memoristic response is powerful – you don’t necessarily have to see a skunk to know it’s there. And although lavender essential oil is chemically sedating, a negative memory of the scent of lavender can cause a neutral or negative response, because memory overrides chemistry. A dog’s sense of smell is remarkably better than ours. There are about 40 times more canine scent receptors than humans have, allowing them to identify smells between 1,000 and 10,000 times better than us. Dogs also have remarkable olfactory memory, and because a dog’s world revolves around scent, aromatherapy is ideal for use with them. When Is Aromatherapy An Appropriate Choice? Because dogs respond so well to both scent and touch, topical applications of essential oil remedies such as massage formulations, calming sprays or grooming products are quite effective. Physical applications – combining aromatherapy with touch – can lead to an emotional response, coupled with a bonding experience and potential behavior modification, and the scent can anchor the experience of loving touch from a trusted caregiver. This experience provides comfort for dogs that are anxious or fearful during unsettling times such as storms, fireworks, travel, competition, adoptions, veterinary or kennel visits, bath time and holidays. Aromatherapy can be a powerful bonding tool for rescue animals and their families. Trainers use aromatherapy to help calm and focus dogs quickly, making other training tools more effective. Kennels, clinics and groomers have found aromatherapy can help the dogs stay calmer and quieter during visits, and because clients are picking up calmer dogs, it can mean less stress for the next visit. Because of the memoristic nature of scent, and the potential conditioning response, it is important for the first application to take place at a non-stressful time. For example, when introducing an aromatherapy mist, lightly mist yourself and hold or pet your dog to help the dog associate the scent with you as a person of comfort and a relaxed moment. This also allows you to see how much of the remedy is needed and how quickly the dog responds to it. Aromatherapy mists are an affordable and simple application to use. You can mist your hands and massage the dog’s abdomen or outer ears. Or lightly mist a favorite bandana to tie around the dog’s neck. You can also mist around a room, inside the travel crate or car, or directly onto bedding. Be creative, but don’t spray the product into the dog’s face, mouth, eyes or ears. For small, young or elderly dogs, one or two mists may be appropriate, and for medium to large dogs it may be necessary to use four to six mists. As stated earlier, with aromatherapy, and especially with a dog’s acute sense of smell, less is more. It is with this attention to customer need, high quality ingredients, safety, effectiveness and simplicity that in 1996, certified aromatherapist and herbalist, Vicki Rae Thorne, founded Earth Heart to promote the use of herbs and aromatherapy as an integral part of everyday health. In 1999, Vicki was approached by a kennel owner who wanted help with calming dogs during new arrivals and feeding times. The dogs experienced a wide range of emotions from being anxious or angry, agitated or depressed, and they all missed their families. The formulation now known as Canine Calm was developed to diffuse in the kennel, and it worked from day one. Customers noticed that their dogs were calmer when they left the kennel, and didn’t fret so much when it was time to go back. This same kennel has been successfully using Canine Calm since the spring of 2000. When kennel customers wanted to take the product home, aromatherapy mists were developed as an affordable ready-to-use remedy. The formulation combines essential oils of bergamot, tangerine, lavender, marjoram, geranium and ylang ylang, which have all been historically used for relaxation. Over the years, customers have shared how much they appreciate Canine Calm to help calm their pets during unsettling times such as thunderstorms, fireworks and other loud noises, parties, training, competitions, adoptions, holidays, bath time, grooming, crating, separation, hospice, and clinic or kennel visits. The floral-citrus scent is a blend of pure essential oils including lavender, bergamot, tangerine and rose geranium…plants that have traditionally been used for relaxation. Guard Well uses gentle yet powerful essential oils – niaouli, ravensare and frankincense – that help soothe dry irritated skin or enhance your dog's health and well-being after exposure to lawn or pool chemicals, cold or dry air, environmental irritants, viruses, bacteria, or long-term use of medications…and it’s a great addition to your first aid and travel kits. Travel Calm was developed as a safe and healthy solution for travel shy dogs. With pure essential oils for relaxation and ginger to soothe stomach upset, this is an effective natural remedy that helps soothe restlessness, drooling, panting, whimpering and stomach upset during travel. Travel Calm can also be substituted for Canine Calm if you prefer an earthier scent. Buzz Guard combines neem seed oil with pure essential oils, and has been favorably field-tested in a variety of settings, from woodlands to wetlands, and shown to be effective in improving your dog’s outdoor comfort during daytime and evening hours. Enjoy outdoor activities such as walking, camping, hiking, boating, dog sports training, competition, and just having a good time in the great outdoors. It is important to note that essential oils are not recommended for use with birds, and must be used very cautiously with cats. Many cats react negatively to certain essential oils, and while experts are not in agreement regarding safety issues with cats, it is generally believed that very limited exposure to quality pure essential oils is a better option than using synthetic or adulterated fragrances. Any of the suggestions or information provided here is not intended to replace qualified medical consultation or treatment. Earth Heart continues to develop remedies that are simple, safe, effective and smell good. Visit our website for more information on products and to order aromatherapy remedies designed with the same loving care you give your dog. Working in rescue, we get a lot of dogs surrendered due to separation anxiety or behavioral issues, and CANINE CALM really helps with these issues. It also smells great! I used the TRAVEL CALM on a 4-hour car ride, and my dog didn't stand up in the car for the whole trip. He no longer drools and vomits in the car. Love this stuff! While our dog doesn't like the heat, he does enjoy being outdoors for short periods of time. Now, with BUZZ GUARD, he can enjoy more time playing and less time scratching. I sprayed CANINE CALM on a couch pillow before going out. When I came home, I thought I’d left the dog outside by mistake, because he didn’t greet me at the door as usual. I discovered him sound asleep on the couch with his head on that pillow! He’s an 83-pound Golden. Millie has allergies that are problematic in the spring and fall, and there are times between the seasons when she has itching fits. One evening she was scratching her ear like crazy. I sprayed a little GUARD WELL on my hands and rubbed the back of her ears and then sprayed a little behind her. She lay down and stopped scratching. I tried TRAVEL CALM with my 6-month-old Airedale, Sonja, because she vomited every time she rode in the car, and I had tried most of the usual fixes, to no avail. I did not want to drug her since we were going to dog training class. To my delight, Sonja rode to and from class last week without vomiting, and she was so focused during class that the instructor commented on her performance. Call and Order From Earth Heart Today! You can have a healthier, calmer, happier and even safer dog with Earth Heart. Call us today and tell us about your dog so we can help you find the right product for you!